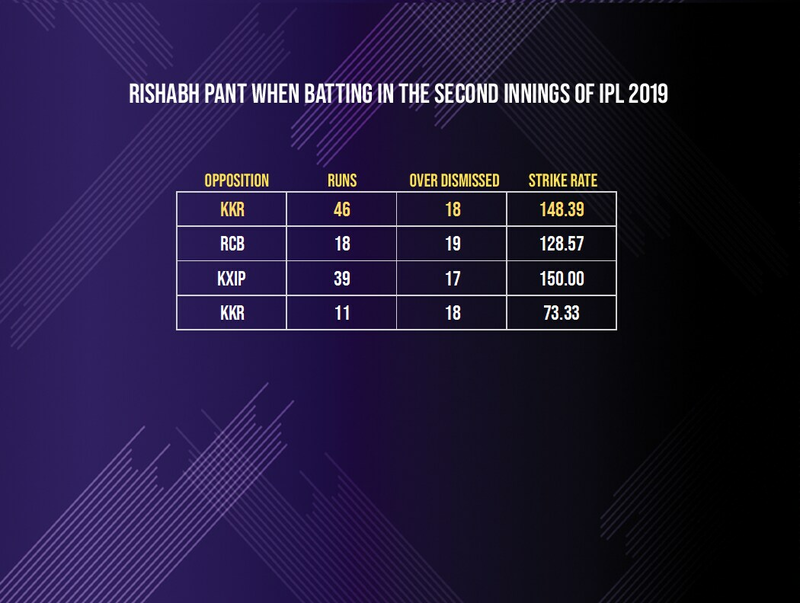 Rishabh Pant isn't the kind of batsman to anchor an innings or contain his shots based on match situations. Yet, on Friday (April 12th) against Kolkata Knight Riders at Eden Gardens, he seemed determined to do both as he happily played second fiddle to a well-set Shikhar Dhawan. Walking in during the last over of the power-play after Shreyas Iyer's departure, Pant seemed more relaxed at the wicket with Dhawan going for his shots. The wicket-keeper batsman took his time to settle in and his first 18 balls yielded just 20 runs. But once settled and the target within sight, Pant took the attack to the bowlers and raced into the 40s. Just as it seemed like he would take Delhi over the line, Pant slogged Nitish Rana straight to long-on in the 18th over of the innings. While it did not cost Delhi the match since they had wickets in hand and not too many runs to get, they raced to a comfortable win, the fact that Pant did not take his side through to the end and again threw his wicket away does not augur well for the batsman. This has become a disturbing trend from the Delhi keeper. In all the four run-chases Delhi have had this season, Pant has been dismissed after the 15th over before seeing his side through. Delhi messed up one of those run-chases (against Kings XI Punjab) and nearly bungled another (the tied match against Kolkata Knight Riders at Feroz Shah Kotla) after Pant's dismissal. Given that trend, Pant ought to have put his head down and sealed the run-chase. Instead, for the fourth time in as many run-chases this season, he threw his wicket away. These minor but important details will be discussed on Monday (April 15th) when the Indian team management and selectors sit to pick the 15 for the World Cup. On the brighter side, Pant did take Delhi close to a win with his late burst after a sedate start. In the process he also turned around his fortunes in and against Kolkata. In three matches at Eden Gardens prior to this, he had made just 50 runs at an average of 16.67 and a strike rate of 147.06. 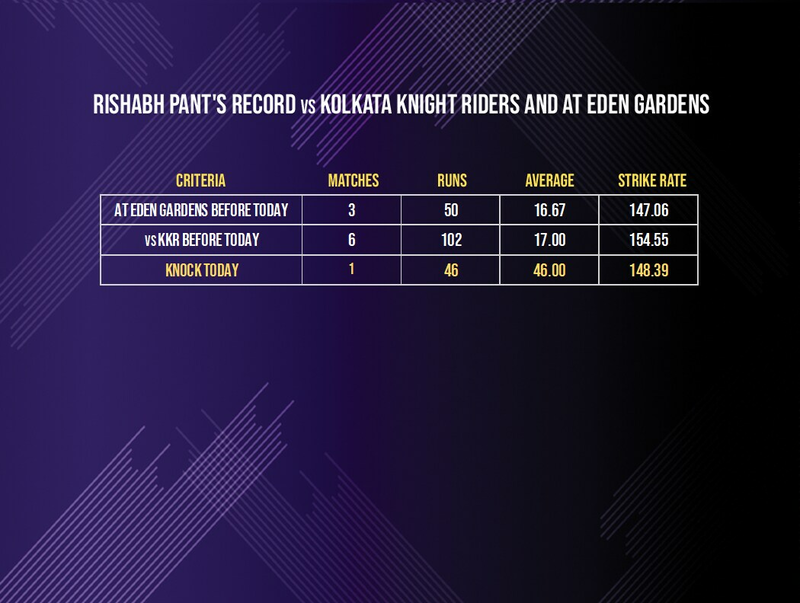 Against Kolkata, Pant had his worst average against any franchise until today. In six matches against them the wicket-keeper batsman had made 102 runs at an average of 17.00 and a strike rate of 154.55. Pant may have turned around his numbers in Kolkata with his performance but has he done enough to be on that flight to England? Will his habit of throwing away his wicket and not finishing matches for Delhi this season cost him? The next 72 hours will give us the answer.